A woman dances with her arms lifted hugging a lustrous full moon as a lover might. The night sings sweetly with whippoorwill and crickets. It seems time stops and for a moment there is nothing but magic. This is the nature of Moonstone. All of the mystery, all of the ancient knowledge down to genetic memory – all we think our soul’s forgotten, Moonstone remembers. The translucent white of Moonstone that waxes and wanes depending on the angle gave it an immediate connection to the lunar sphere among many ancient civilizations. Merchants carried it on trade routes, touting its magickal ability to protect travelers and predict the future. From the Orient to Rome and beyond seers and healers chose Moonstone as a gift that binds the ties between star-crossed lovers, as an amulet of hope and charisma and a tonic for insomnia. What more comfort than sleeping under a shining moon with the stars swirling behind like a curtain. Moonstone is a type of Feldspar. While most of us think of the traditional white-opalescent stone, it actually comes in various colors each of which has slightly different metaphysical properties. A Blue Moonstone encourages awareness and inner peace. Gray Moonstone serves those who travel the realms, bringing their spirits home safely. White Moonstone taps into our emotions as well as the Water element (since the Moon rules tides, that spiritual vibration remains in this healing crystal). Yellow Moonstone acts on a mental level and Rainbow Moonstone brings hope, the ability to work with Spirits and all of the wonders that await us in Universal awareness. It is said that the Moonstone spirit is most potent during the full moon. Hindu legend even goes so far as to say that this mystical stone came from moonbeams themselves. Nonetheless much depends on how you plan on using Moonstone metaphysically. Sometimes the subtleness of other lunar stages suite very delicate situations that require “kit gloves” Emotional recovery from abuse is one example that might benefit from working with this healing crystal during a waning phase to amp down those unhealthy feelings. 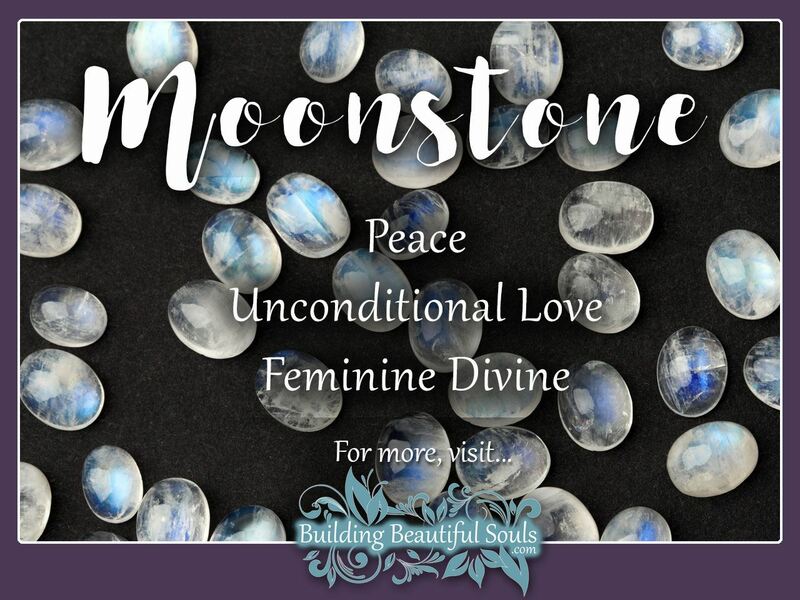 There is a loving element to Moonstone. As you travel with this Spirit it teaches how to give and receive love as well as all important self-love that becomes the foundation to spiritual development. Peace Moonstone seem best for the personal processes. On a more carnal level Moonstone also motivates Kundalini. If you’re wanting to make love all night long, wear a white Moonstone (and bring the Viagra). Professionals in service-oriented fields or jobs where they need keen insights find Moonstone is a great partner. Keep it where you work often for powerful communication and discernment. While Moonstone ties to the celestial realms it is not without some down-to-earth qualities. As Moonstone brings emotions into check, you in turn find ways to create the sacred trinity of Mind-Body-Spirit work effectively together. Moonstone’s Spirit is full of gratitude, respect and sensitivity. Unlike some other forceful healing crystals, Moonstone won’t hit you over the head to get your attention. Rather it encourages self-exploration, introspection and eventual recognition. When the moment of insight comes, you’ll know the next steps on your Path toward spiritual awakening and broader understanding of the Divine. While often considered a “woman’s stone” men struggling with emotions can use Moonstone too. If you’re too sensitive or not sensitive enough, Moonstone adjusts that internal meter. Find yourself quarreling a lot? Carry a moonstone. Feeling indifferent? Carry a Moonstone. Remember, Moonstone job is reflecting your Sacred Self. This makes it highly personal for metaphysical applications. It’s easy to see how Moonstone got its name. The way light moves through the crystal makes it appear like a ray of light moves on the surface (very similarly to cat’s eye). This effect is called adularescence. The visual impact is like looking at a lovely shining moon. When looking for the highest quality Moonstones at a metaphysical outlet, seek out those harvested in Sri Lanka.